Le Royal Méridien National offers comfortable, quiet and secure accommodation in the very centre of the Russian capital. It is only two minutes walk from the Red Square and the Kremlin, five minutes walk from the Bolshoy Theatre. 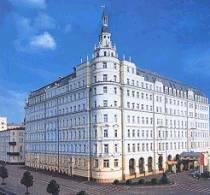 The hotel was built in 1903 by a famous Russian architect and was fully renovated in 1991-1995. There are superb views of the Red Square and the Kremlin from restaurants and bedrooms. Accommodation is provided on 7 floors, in 231 comfortable rooms, including 37 Suites, 10 rooms furnished with antiques. All of the guest rooms are nicely equipped with bath or shower, air conditioning, satellite television, in-house movie, radio, direct dial telephone, mini-bar, hairdryer, trouser press. Restaurant Moskovsky is known for its exceptional Russian and European cuisine. Its windows open a unique view at the Kremlin and the Manezh Square. However what makes this restaurant really unique is the high level of service, refined interiors and historical atmosphere. . Your reservation can be canceled at latest 48 hours before your arrival. If you will not cancel your reservation on time or will not arrive to the hotel, we will charge your card for the first night as a cancelation fees. The payment will be made from your credit card details. The credit card which you sent us we will authorise at earliest 10 days before your arrival. The money will be still on your credit card but you will not be able to use them. The chargment will be made during your stay. The Moscow Aerostar is a 413-room Canadian-Russian Joint venture hotel. It is a ten-minute drive from the heart of Moscow and is right on your way from the airport. Its style combines European Elegance with North American efficiency. Marble interiors, paintings and many other amenities make the atmosphere sophisticated and warm. The hotel is known for excellent Canadian management and security. The three-star Budapest Hotel (5 floors, 120 rooms) was built in 1876 and combines traditional Russian architecture with modern comfort. The hotel is located in the city centre. This three star hotel is conveniently located in a new part of Leninskiy Prospect, which is one of Moscow major thoroughfares. But in the same time this region is considered to be ecologically cleanest place of the Moscow. The Central House of Tourists offers 537 rooms and 49 suites located over 33 floors of the hotel. The Hotel Complex Cosmos is located in one of the most beautiful and ecologically healthy districts of Moscow. It gives a wonderful view of the Botanical Garden and the National nature reserve "Lossiny Ostrov" (The Elk Island). The majestic 26-storey hotel structure built in 1979 in accordance with the project created by French architects is a truly impressive sight for both city visitors and Moscovites born and bred. The imposing architecture is combined with the magnificent interior decor of the halls, gourmet cuisine offered by the restaurants, sophisticated splendour of the rooms. Here you will feel on top of the world. The Holiday Inn Moscow Vinogradovo is a recently opened hotel situated in beautiful countryside, only a 15-minute drive from the Sheremetyevo International Airport and a 40-minute ride by bus from the city center. The four-storey Holiday Inn welcomes its guests in 154 very comfortable hotel rooms, including 8 apartments. Classic European hotel with historic facade dating back to 1898. Situated in the very heart of Moscow. Long since known for its style, service and traditional Russian hospitality, this hotel provides business and leisure guests alike with the perfect base from which to explore the capital. It is one of the most elegant and distinguished addresses of Russia, and in Moscow it sets the benchmark for world-class accommodation. In fact, the five-star Kempinski is the only hotel in Russia's capital city to enjoy membership in the prestigious international association of Leading Hotels of the World. For those who demand the finest in service and comfort, this grand hotel is quite simply the only suitable accommodation in Moscow. The Iris Congress Hotel Moscow, nestled in a calm residential neighbourhood, is located 35 minutes from Sheremetievo Airport and the Kremlin, and has permanent access to the city centre. The hotel has an up-to-date business centre making it an ideal place for business travellers. 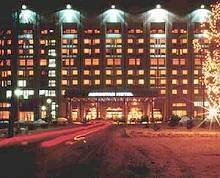 The Ismailovo Hotel Complex, consisting of four separate blocks - Alfa, Beta, Vega and Gamma-Delta, offers all the comfort and services necessary for both tourists and business travellers. It is located only 30 metres away from metro station Ismailovskiy Park, in the greenest area of Moscow. The Hotel overlooks Ismailovskiy park of Culture and Leisure and Moscow's new residential area. Of particular interest for tourists is the neighbouring Ismailovo Market, one of the city's major attractions due to its extensive array of traditional Russian gifts and souvenirs. During the 1980 Moscow Olympics the complex was used to accommodate many of the athletes attending the games. At the present day its guests enjoy a wide range of facilities, friendly service and hospitable atmosphere. The hotel's well-developed infrastructure creates the favourable conditions for work and pleasure. Totally there are 7500 rooms in the complex. The 30 storey Gamma-Delta blocks comprise 1972 comfortable rooms. Le Royal Meridien National stands on the cross of Mokhovaya and Tverskaya streets overlooking the walls of the Kremlin, the Manezhnaya and the St.-Bazels Cathedral. The hotel was built in 1903 by famous Russian architect Alexander Ivanov in a modern style with elements of eclecticism. The hotel is only minutes from main business addresses, shopping areas and the famous Bolshoi Theatre. The hotel has 221 rooms all well furnished with exquisite pieces of antique and art. The hotel was a Moscow away from Moscow for a century, providing its guests luxurious and secure accommodation in the very heart of the Russian capital.